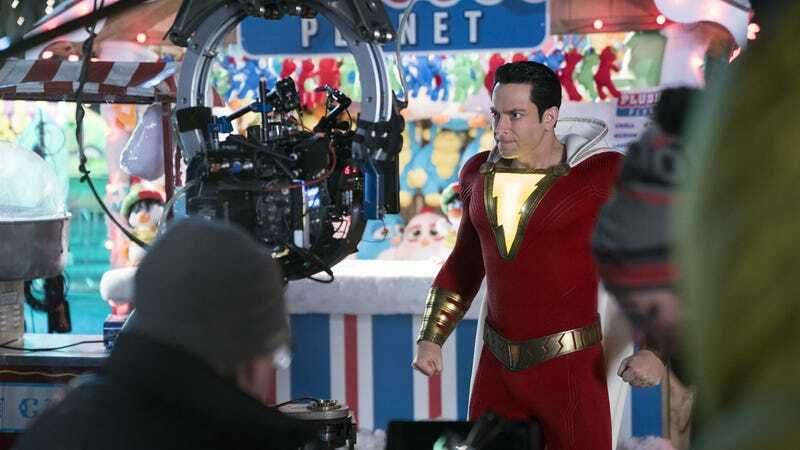 Zachary Levi gets mad at a winter carnival on the set of Shazam. 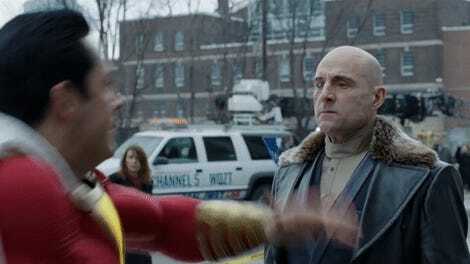 If you want to know how Shazam is going to be different from the DC Entertainment films that preceded it, you need only reference two scenes: One in which the hero fights the bad guy in a toy store filled with DC superhero merch, and another where a big fight takes place at a festive winter carnival, complete with a giant Ferris wheel and dozens of games. Not your typical DC movie. Not your typical superhero movie period. But that’s Shazam. Like Justice League, Batman v Superman, and Suicide Squad, Shazam is 100 percent set in the DC movie universe. However, hewing closer to Wonder Woman or Aquaman, it’s going to feel like a standalone movie with its own mythology and tone. But even compared to the bright, hopefulness of Wonder Woman and Aquaman, Shazam feels like it could be another level. Similar to the DC Comics story, the hero in the film is 14-year-old Billy Batson (played by Asher Angel), chosen by an ancient wizard (Djimon Hounsou) to be his champion and possess all the power of Shazam (the beings Solomon, Hercules, Atlas, Zeus, Achilles, and Mercury). Just by saying “Shazam,” the boy becomes a full-grown adult, played by Zachary Levi. The movie has a young cast, is filled with humor, and really, only has one darkly lit set (the crucial Rock of Eternity where Billy meets the Wizard). Even Shazam’s costume isn’t the typical dark blue, black, or green. It’s bright red with a gold belt, boots, and gauntlets, complete with a short white cape and a blinding yellow lightning bolt that lights up practically on set (it goes from dim to blindingly bright with the touch of a button). The idea is, he’s what a 14-year-old who lives in a world where Superman and Wonder Woman exists might draw if he imagined a superhero. Freddy (Jack Dylan Grazer) and Zachary Levi (Shazam) share a “beer” with director David F. Sandberg. On April 18, 2018, in Toronto, Canada, the crew of Shazam was on day 51 of their shoot. The cold of Toronto was doubling for Christmas time in Philadelphia, Pennsylvania, which is when a young Billy is placed in a foster home filled with kids from varying backgrounds. Sandberg shot the scene where Billy enters the house as a three-plus minute Steadicam shot as actors go in and out of various rooms, creating a very dynamic, overwhelming environment. Billy can barely keep his head from spinning, there’s so much going on so fast. And though the family is large, Billy gravitates to Freddy (Jack Dylan Grazer), who is a massive fan of superheroes, going so far as wearing an Aquaman t-shirt during this scene. (So, yes, it’s canon that you can buy DC merch in the DC universe...I wonder who gets the royalties?) And though later in the day Sandberg filmed a scene of Billy trying to escape, this idea of a big, warm, family is at the heart of Shazam. Freddy and Billy explore Freddy’s room which, as you can see, is filled with DC stuff. Along with the story of Billy getting the powers of Shazam, the film will simultaneously follow Dr. Thaddeus Sivana, whom the audience will meet as a young child in the film’s opening. Long before Billy was granted his powers, Sivana was given the same opportunity but was seduced by a more evil power, the Eye of Sin. He spends the rest of his life trying to change that and, eventually, finds himself with the ability to control the seven deadly sins, which will physically appear in the film. Shazam may have met his match in Dr. Sivana. “[Dr. Sivana is] a good, proper supervillain,” said Mark Strong. Don’t let that bubble get in your hair, Billy.